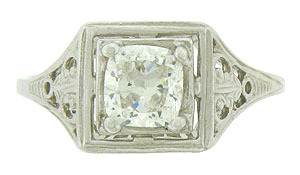 A brilliant AGS certified, .71 carat, G color, Si2 clarity, cushion cut diamond is presented at the center of this handsome vintage engagement ring. 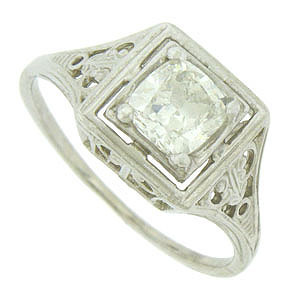 The dazzling stone is set into a square shaped center mount, while the shoulders and sides of the ring taper to the band. Intricate organic cutwork and engraving adorn the mounting. 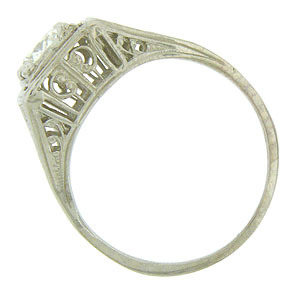 The ring is fashioned of 14K white gold and measures 8.77 mm in width. Circa: 1940. Size 5 3/4. We can re-size.